Professor Katrina Hoyer (left) and QSB graduate student Kristen Valentine. In 1998, scientists studying rheumatoid arthritis observed a population of immune cells that weren’t behaving the way they were supposed to. Immunologists noted the strange phenomenon, but decided not to pursue the subject further, and the cells were soon forgotten. But interest in these cells has swelled over the past few years as they’ve been found in patients with chronic viral infections and cancer. 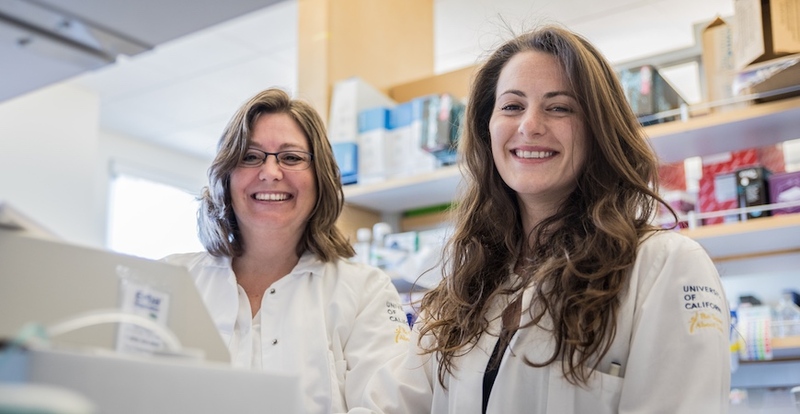 Now a new study, led by Quantitative and Systems Biology graduate student Kristen Valentine and UC Merced Professor Katrina Hoyer, published in The Journal of Immunology shows that these cells play a major role in autoimmune disease. Valentine and Hoyer were studying autoimmune diseases in mice when they found CD8 T cells — similar to those first identified in 1998 — popping up in strange places in mice with autoimmune hemolytic anemia (AIHA), a disease where the immune system targets healthy red blood cells for destruction. “We noticed that some CD8 T cells were moving into an area where they had not been seen before,” she said. The killer cells were spotted in areas of the lymph nodes usually reserved for B cells — immune cells that produce antibodies, special proteins that engulf invading pathogens and tell other immune cells to destroy invaders. Autoimmune disease is when your immune cells...make a mistake and instead target your own cells for destruction. Helper cells, or CD4 T cells, are the immune system’s conductors. They help activate other immune cells — like killer cells and B cells — and tell them how to do their job better. The CD8 T cells found in the area reserved for B cells were behaving like CD4 T cells and telling the B cells to produce antibodies that targeted red blood cells for destruction. After eliminating the CD8 T cells, there was a huge reduction in antibody production. In other words, these misbehaving killers were promoting autoimmune disease. Until this discovery was made, scientists hadn’t seen killers acting like helpers. It’s a breakthrough that upsets much of the prevailing wisdom about how autoimmune diseases progress. How delayed? After getting rid of these misbehaving CD8 T cells, mice with AIHA survived two and a half months — a huge improvement over the usual three weeks. Valentine and Hoyer hope the story doesn’t end there.